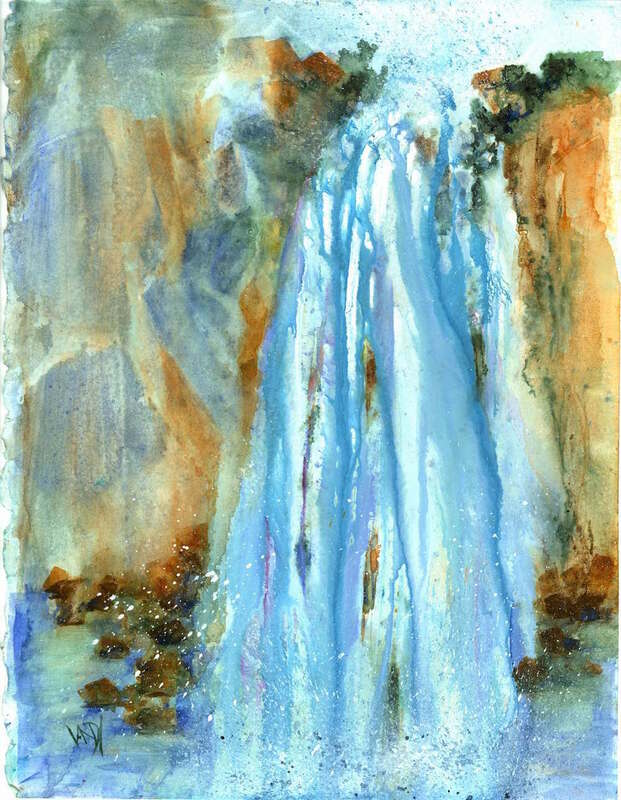 Viewed from the bottom of the waterfall, the water is the star in this painting. Water is increasingly a feature in my work. I love its dynamic nature and its many facets: in this painting, the power and energy of the falling water as it crashes onto the rocks. I treated sections of the painting differently to achieve the effects of energy in the water, and solidity in the rock face. The under-wash of acrylic medium in blocky shapes of the rocks was allowed to dry and treated as an adapted support for the image. 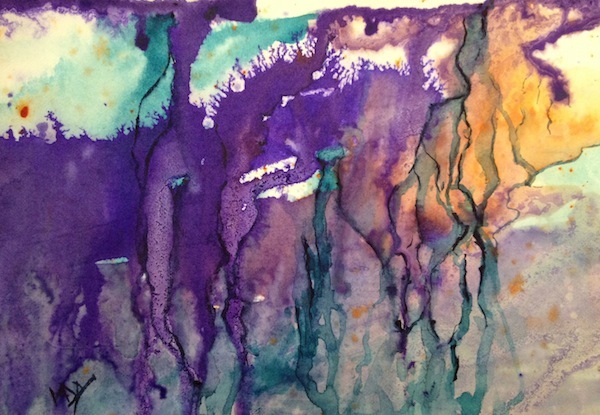 Conversely, the acrylic medium was included at the wet stage for the cascading watercolour waterfall. This allowed the mediums to mingle and interact on the paper with breaks showing the rock face behind the cascade. The Cascade watercolour has been added to my Artfinder page. Medium: watercolour with some acrylic medium. Not much studio time this week, partly because I’ve been spending time on making creative images in a new way. 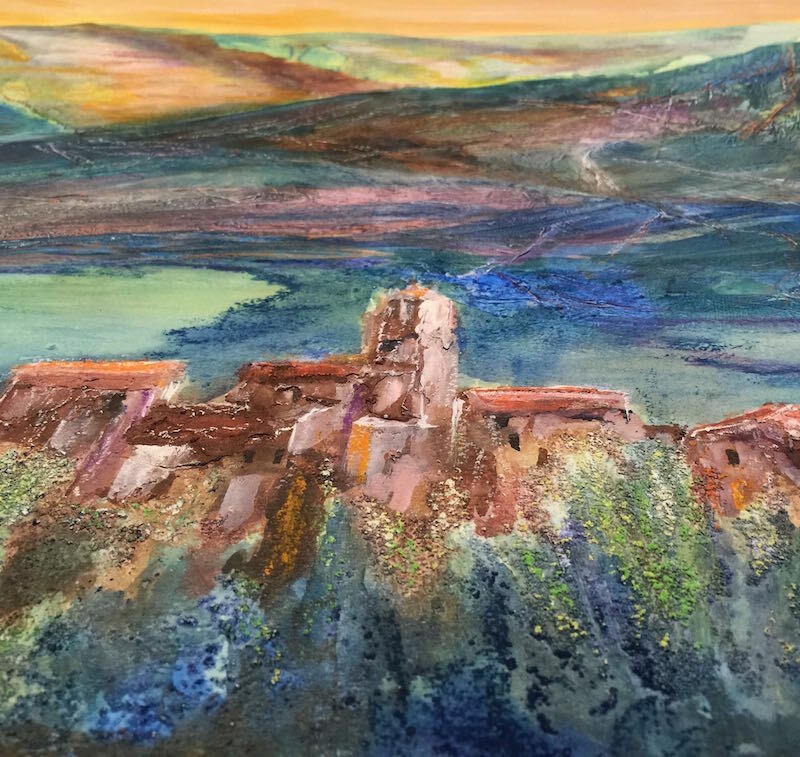 Inspired by a newsletter from the fabulous marketing department at Artfinder, I took some detailed photographs of a recent mixed media painting of Borgo di Santa Giuliana. The painting itself has an element of expressionism to it, not least in the alternative colours used to convey the wonderful warm light in the Italian hills. So it seemed a fitting one to choose to play with perspective using my phone camera. I am particularly pleased with the emphasis this perspective gives to the wonderful old walls of the buildings in this medieval settlement. The textures in this painting stand out really well when its photographed at an oblique angle. It’s not something I would have considered doing before, but now I have done it, I really love the way this sort of creative image gives the viewer a really close look at the painting’s detail. Even the relatively un-textured hillsides in this painting come to life more when viewed really close up. And the light effect shining through the gap in the hills becomes even more apparent too. Now that I’ve started to explore the idea of making more creative images of my artwork, I’ll start thinking about showing them differently in future. In other news, I’ve been experimenting with a new bit of kit over the weekend. It was high time our office printer was replaced. We’ve been operating with one small printer/scanner/copier for years now and it’s getting long in the tooth. So when our new whizzy A2 printer with an accompanying high resolution scanner arrived, I couldn’t resist playing a bit. This is the result of my working my way through an entire sample pack of fine art paper: Artist proofs all over the place. The scanner works a charm too – great colour resolution and wonderful detail. I’ve now found the paper I really like, have ordered two pack (different sizes) and will be able to do my own giclée prints from here on. This has been a real creative image week for me – and for once, it was not my brush doing the work, but technology. 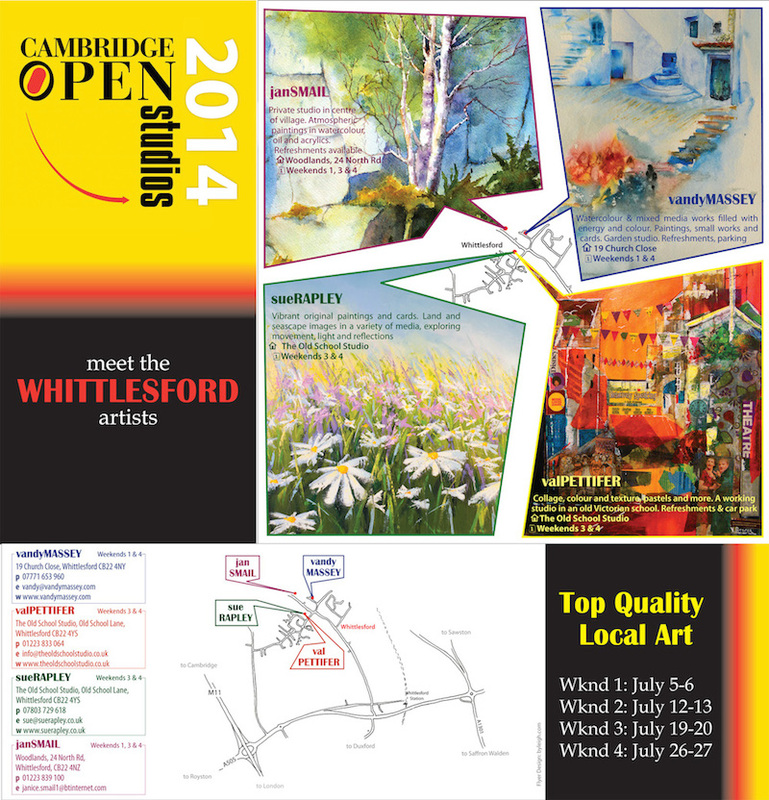 The village will be buzzing with Whittlesford art events this July. For the first time, four artists will be collaborating locally to stage complementary exhibitions as part of the Cambridge Open Studios programme. 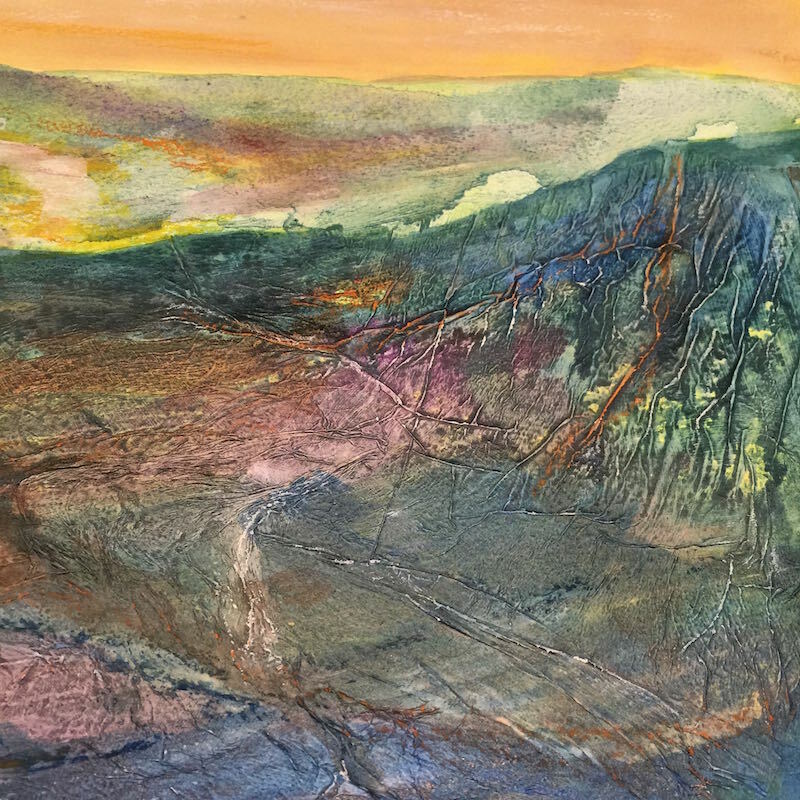 Two watercolour artists (Jan Smail and Vandy Massey) and two mixed media artists (Sue Rapley and Val Pettifer) will be showing their work on three of the four weekends in the month of July. 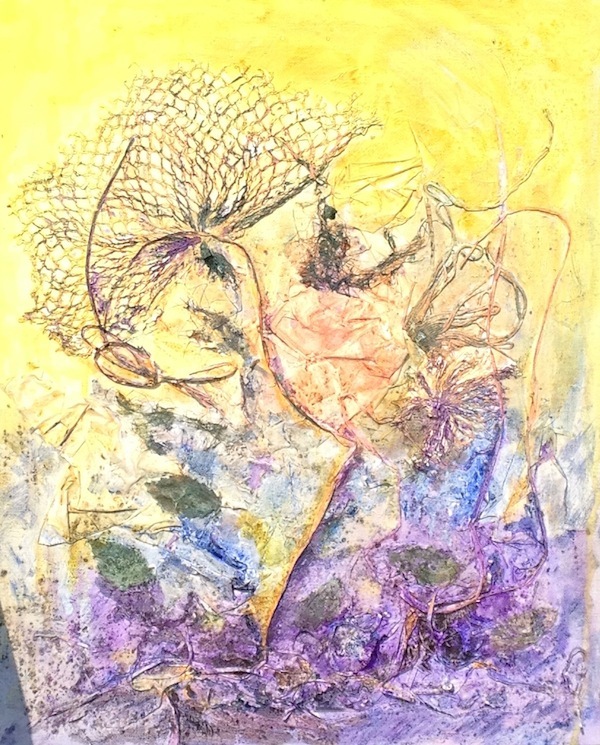 Visitors to the village on July 5th and 6th (weekend 1) will be able to see works in the studios of Jan and Vandy. On July 12th and 13th (weekend 3) Jan Smail will have her studio open, and the works of Sue and Val can be seen at the Old School Studio. 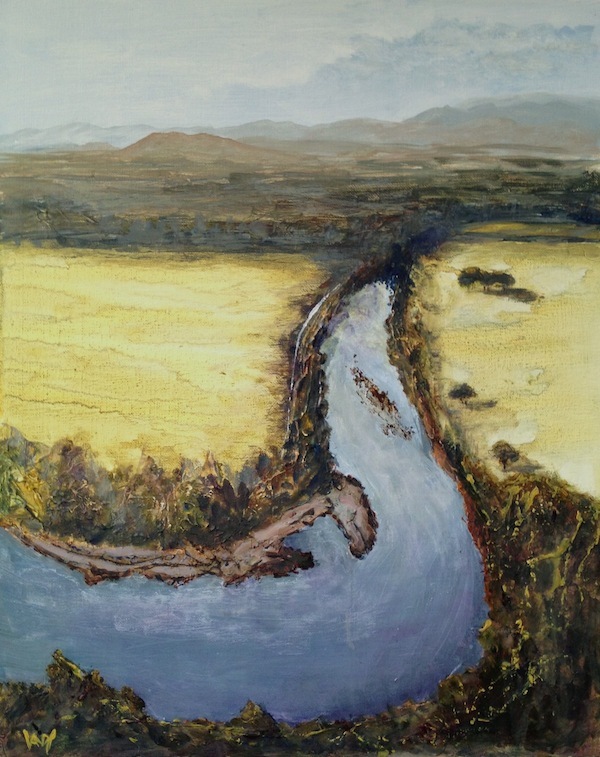 If you want a real bonanza weekend, head out to see the Whittlesford Art Events on July 26th or 27th (weekend 4) when all four of the artists will be exhibiting. Refreshments will be available at all the studios and there are gardens to be viewed at the same time as all three places have lovely garden elements. Art lovers visiting the village can also pop in to Oxbow & Peach, purveyors or wonderful vintage pieces, and pick up information about some of the fabulous courses being run at the Old School Studio. Over the past year, Whittlesford has become a centre for art events in the area thanks to the re-opening of the Old School Studio, Essex Framing and Oxbow & Peach. Together they create a great browsing experience for a creatively-focused day out. 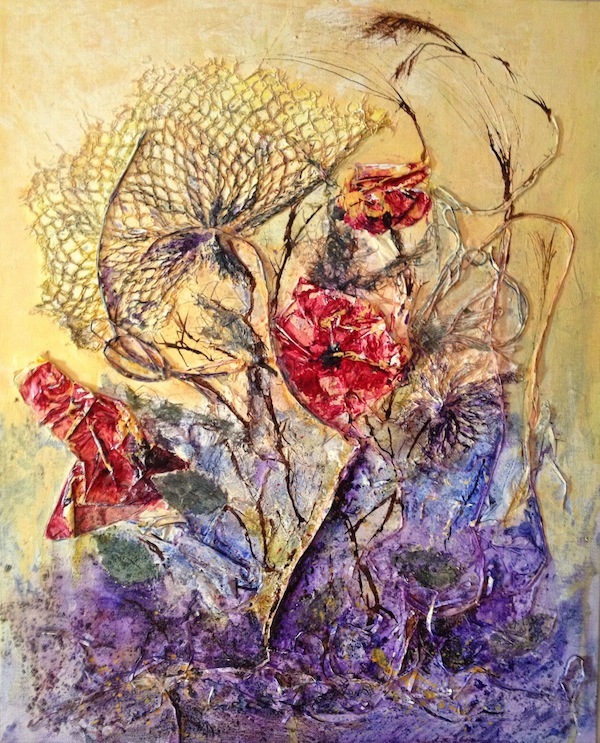 Cambridge Open Studios exhibition days provide the perfect opportunity to see the work of the Whittlesford Artists, Jan Smail, Val Pettifer, Sue Rapley and Vandy Massey at the same time as having a taste of the burgeoning art community south of Cambridgeshire. Expertise comes with time and a lot of practice. One of the aspects of painting that distinguishes an artist is their particular style of mark-making. For most artists this is one element of their work that develops over a period of working with different materials, and a range of tools. Over the short years I’ve been painting, I’ve managed to accumulate a slightly embarrassing collection of brushes. 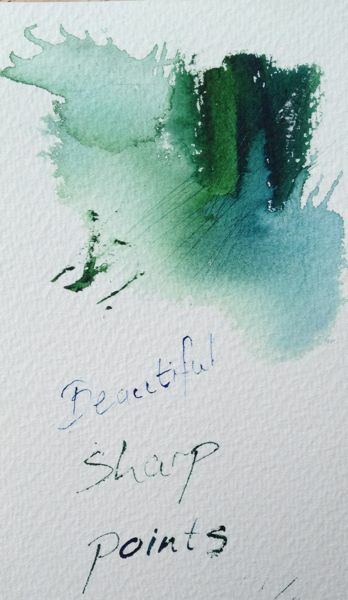 I’m less addicted to buying new brushes than I am to to acquiring new tubes of colour – but only just. And I’ve recently discovered a couple of new mark-making tools that are quite unusual. But first I’ll show you the traditional tools I have in my studio. Watercolour is my favourite medium at this stage. I’m still enthralled by the surprises this medium brings. I’ve been working mainly in watercolours so it accounts for the bulk of my tools for it. Every artist has a favourite blush. My favourite brush has changed over time. For a long time a size 10 kolinsky sable round brush was my go-to tool. Since then I’ve tried some great synthetic brushes which have good points and are quite robust and hold a good point. I’ve recently discovered a sable filbert which is fast moving into my small group of ‘most favoured’ brushes. My all time ‘can’t live without it’ brush is a size zero rigger. It’s just perfect for adding those last little details. 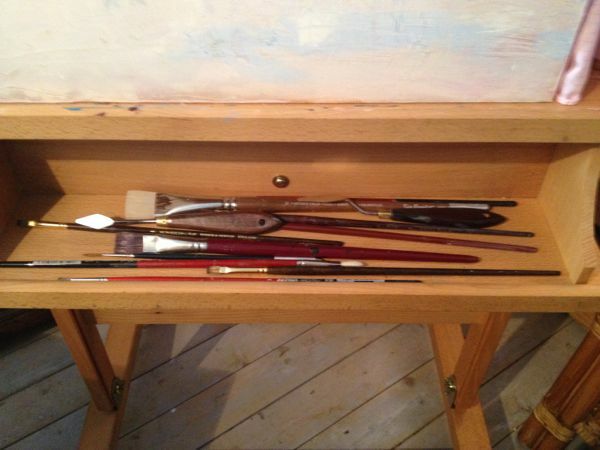 Other watercolour tools include old credit cards, toothbrushes, sponges (not visible in this painting) bamboo sticks, eye droppers and ballpoint pen outer sleeves. There are probably a few others in this photo, but those are the ones I use most often. Last year I had a dabble with mixed media and acrylic paint. 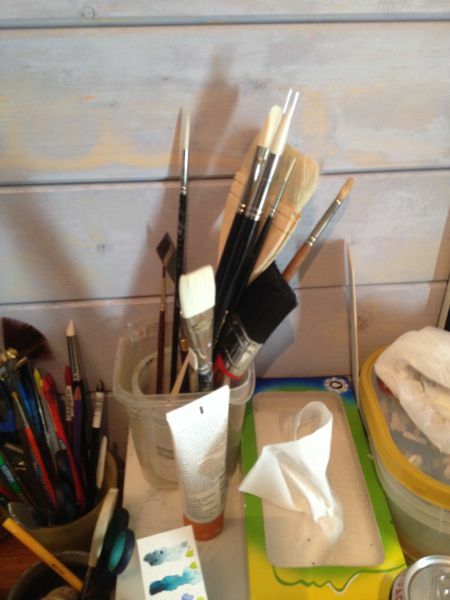 As you can see from the state of my collection of brushes for acrylics, I’ve not done very much of with them. This is a limitation of time rather than anything else. I’ve managed to prepare some canvasses so ‘watch this space’. 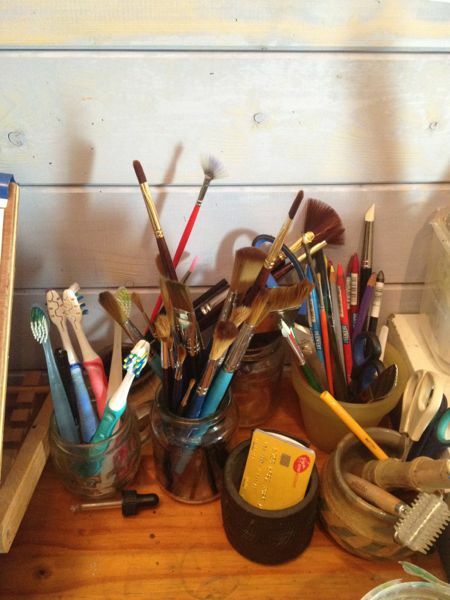 The brushes are at the ready. I’ve done a little more with oils, but still consider myself a rank beginner in this medium. As with acrylics, my main limitation here is time. But these brushes have been used once or twice and will be again. My two main suppliers of brushes are Rosemary’s brushes and for the acrylic brushes, Escoda. I’m always up for a experimenting with watercolour. On my recent trip to South Africa, I was looking for some hand and body lotion and wandered into Rain. While I was browsing I noticed these two items: which looked ideal for a bit of watercolour application. So I bought them both. Here’s what happens when you play with the loofah. The red in the middle of the page was paint applied to the loofah which was then rolled across the paper. The blue and green marks were made by dragging the loofah across the paper using quite wet paint, and the quin gold was applied very thickly and then dragged. I can see all sorts of interesting marks in this. 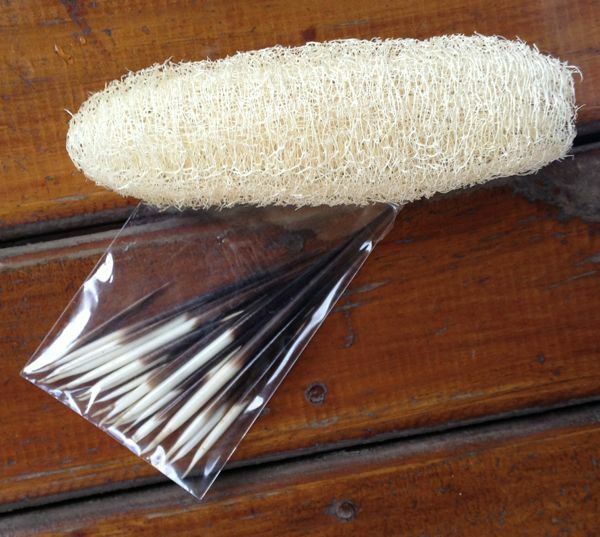 Sadly, when I unpacked back in the UK I discovered that the loofah had been left behind somewhere on my travels. But now that I’ve tried it, I’ll be looking out for a new one. The porcupine quills are interesting. They have very, very sharp points so you have to be quite careful using them. The other (white) end has a little bend in it – each one slightly different. Although the beautiful sharp points are great for sratching out and making very fine lines, it’s the other end that is the most interesting to work with. I’m enjoying this new tool. My next post will be a painting I did using the quills as one of my main mark-making tools. Ready for winter action, hanging on the wall. Even in the UK, December ice skating is a holiday activity for December. This year there are as many as eight ice skating rinks set up in London for the pleasure of winter revellers. 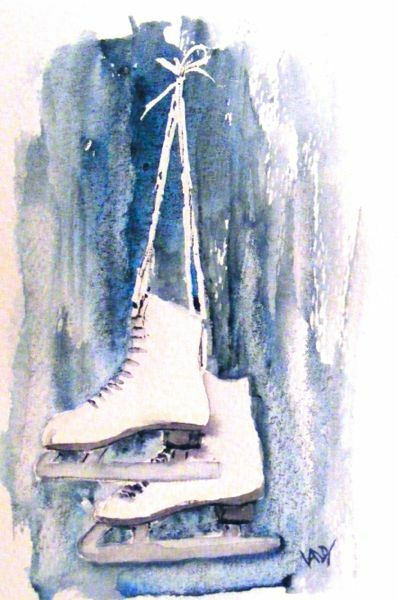 For those of us who don’t actually have any skates, a painting in my December give away series will have to do. Some months ago I was thrilled to see that the demonstration for the Saffron Walden Art Society was to be done by Hashim Akib. I’ve wanted to see Hashim work for some time. I love the dynamism in his acrylic paintings and the boldness of his colour work. So I was absolutely gutted when I got delayed in London on a work project and didn’t get back home in time to go to his demonstration on the Friday evening. I’m still hoping that one day I’ll have the opportunity, but in the meantime, I’m adding him to the list of Advent Artists. Hashim’s work can also be seen on his Facebook page. If you’re in London any time in the next week, you can see one of Hashim’s paintings on exhibition at the Mall Galleries as part of the annual exhibition of the Royal Institute of Oil Painters. The exhibition is on from today until 21st December 2013. 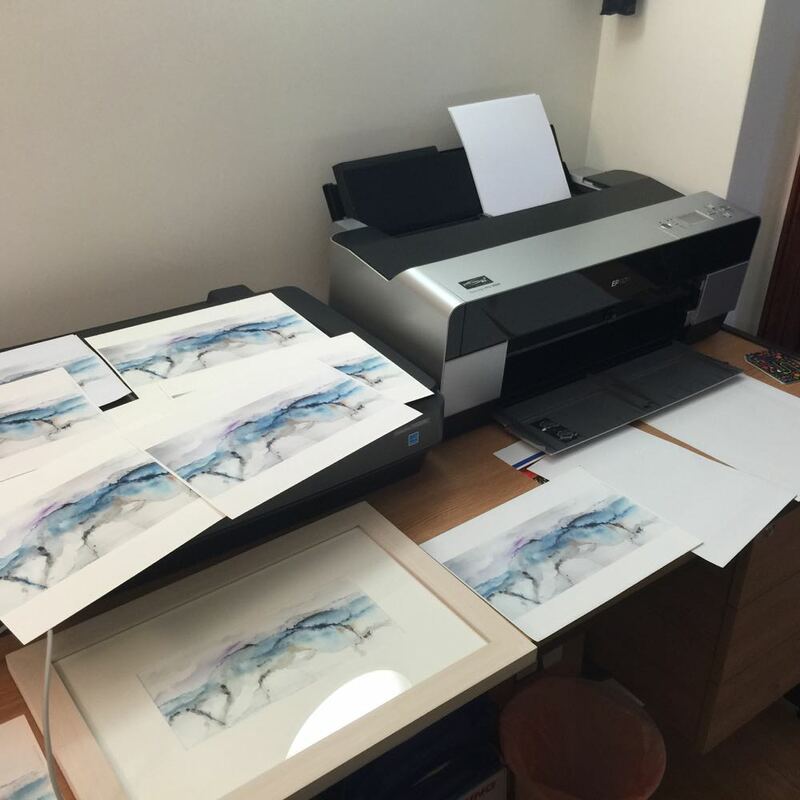 The Saffron Walden Art Society and Beales department store have come up with a lovely partnership which is great for customers and for members of the art society. 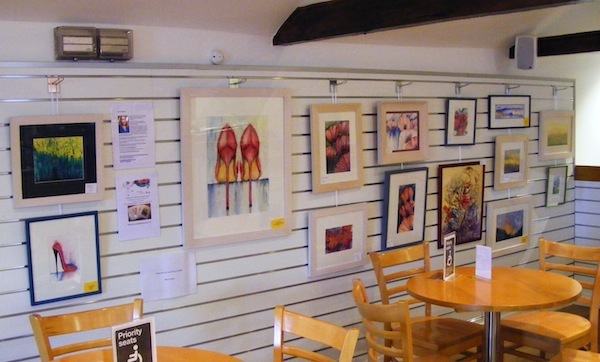 Every month a new artist, or group of artists get to exhibit their work in the restaurant on the third floor at Beales. The full display needs about 20 paintings if it’s not going to look a bit thin, and I wasn’t quite sure which paintings would work best in the space. So having travelled down to Glastonbury to collect the paintings that were on exhibition there, I had a full complement back home and we loaded the car with the lot. We were quite grateful for the little elevator up to the restaurant which was just big enough to squeeze in two of us with my painting bags and proceeded upwards at a stately pace. Under normal circumstances I’m all in favour of getting the exercise of walking up stairs, but with 5 loads of paintings to carry, we took the easy route. Twenty paintings exactly were hung in the lovely bright space. I hope the patrons of Beales restaurant enjoy looking at the collection until the end of the month. My experimental journey continued into painting 29 of 30 Paintings in 30 Days. 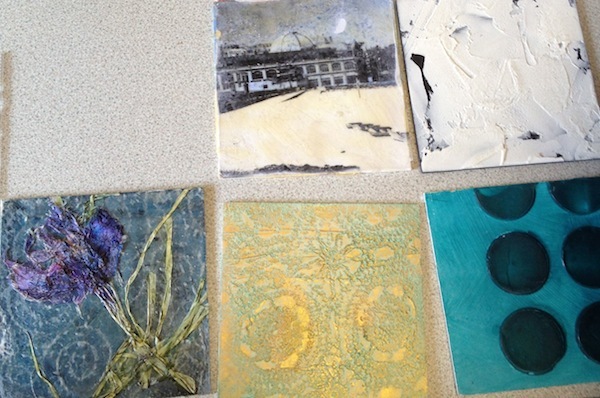 It started with a trial of acrylic inks which created wonderful fractals when water was applied. Once that was properly dried, I added a layer of phtalo turquoise watercolour and let it emphasise the textures in the painting. The orange ink had a sort of molten lava look about it, which inspired the theme of fissures running down through layers of rock. Only one more to go. Here’s the second last one on RWB. And then I did a proper grown up painting on Day 2 of the workshop. I’m rather pleased with the way this turned out. The planning and execution all went the way it was meant to. Acrylics are definitely firmly on the agenda. There was even more information to absorb on the second day of our workshop weekend with Georgia Mansur. 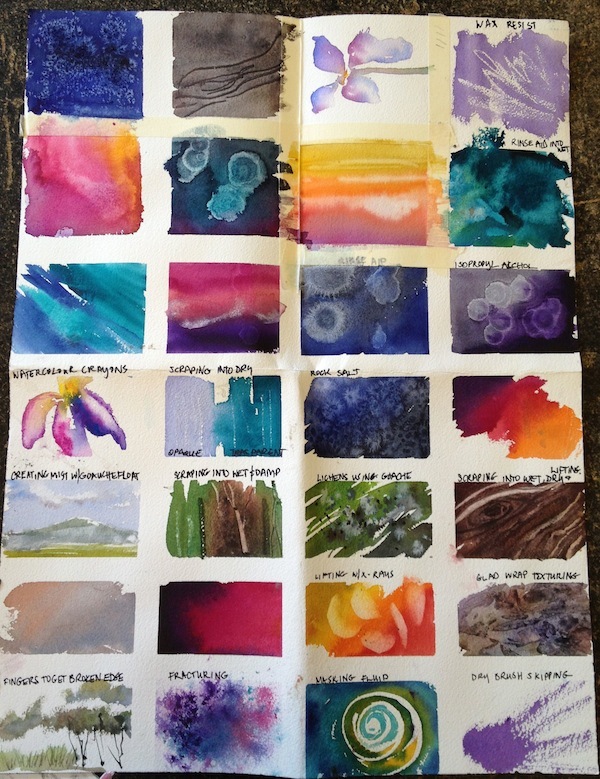 Her sample sheets of watercolour samples are mesmerising and fascinating and make me want to rush around my kitchen grabbing rinse aid and bleach so I can play with new effects. After looking at these, we moved on to talking about gels and pastes, and once again Georgia has a brilliant set of examples to illustrate their textures and provide inspiration for their use. Georgia send out course notes and preparation work before we arrived. Even so, I found I was writing copious notes on all the additional ideas she shared. She really is phenomenally generous with her knowledge. As a follow up to our initial loosening up painting on Day 1, we were ready to paint a more structured painting on the second day. Although much of what we learned was practical, technique-oriented work, perhaps the most valuable part of the weekend for me was the opportunity to reflect on the less tangible elements of painting. In that department, here’s what resonated most for me? – Creativity is problem solving. Thinking about it in these terms really works for me. It’s part of what I love about the challenge of painting. – Boundaries are liberating. Learn to see creative uses for every day items. – Suspend judgement. Stop the negative self-talk from blocking your creativity. – Allow time and space for the right brain to join in the playing. – The time when you feel most frustrated may well be the time just before a breakthrough: persevere. – Creativity involves all your senses. Pay attention to everything around you (I’ve always called this living consciously). So often we forget to do that as life overtakes our free time. I’ve got so much wonderful material to work through and absorb. If the aim of a workshop is to push you to the next level with your painting, Georgia’s sessions do that, in spades! Back in the studio, I’ve put the finishing touches to Meadow Flowers, and found a fabulous box in which to store my collection of treasure for use in future paintings. I’ll put a photo of my Day 2 painting in tomorrow’s post. I’ve just finished day one of Georgia Mansur‘s Seductive Surfaces workshop and my brain is buzzing! Georgia has so much knowledge to share and so many techniques to teach, I found myself making a list of new materials to buy, and my head so full of new ideas I don’t know where to start. I intended to take lots of photographs, but I’m afraid I was so busy having fun with new materials that I kept forgetting to take pictures. So there are a few, but perhaps not as many as there could have been. The day kicked off with a discussion about creativity. Georgia shared her tips for loosening up and building creativity. The tone was set for the day, allowing everyone to create our first abstract paintings without judgement. So often, we are our own greatest critics. We beat ourselves up when we don’t think we have done well enough. Today was about suspending all that negative self-talk and just playing with new materials. A tiny selection of Georgia’s texture samples. Georgia comes well prepared with plenty of examples and samples for everyone to look at. Given how much information she has to share, these form a fantastic resource. 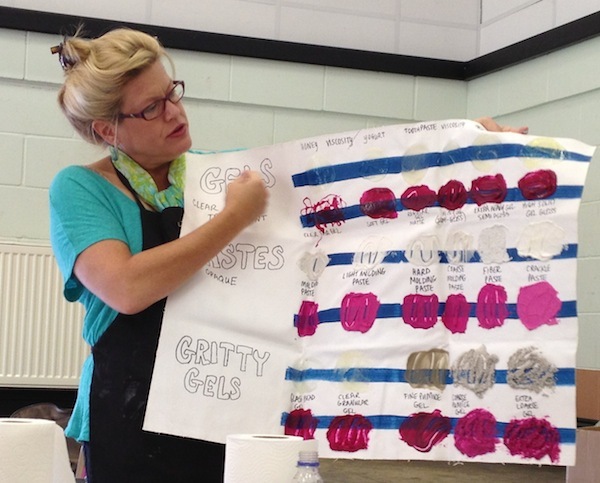 Samples of different watercolour and acrylic paint effects were in constant demand during the day as we all wanted more and more ideas. The real work started with a rummage through Georgia’s treasure trove of paper, twine, lace, fabric, pictures and much, much more. 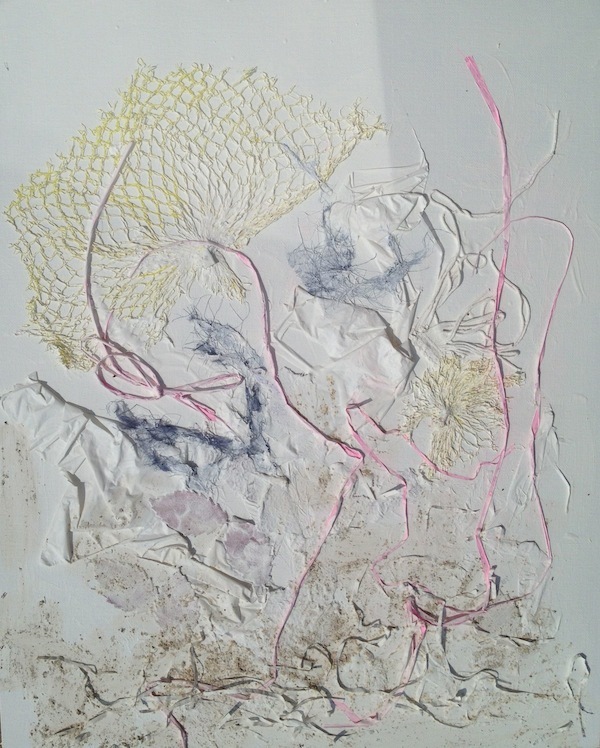 Her demonstration started with a period of intuitive composition with a selection of texture-creating materials. 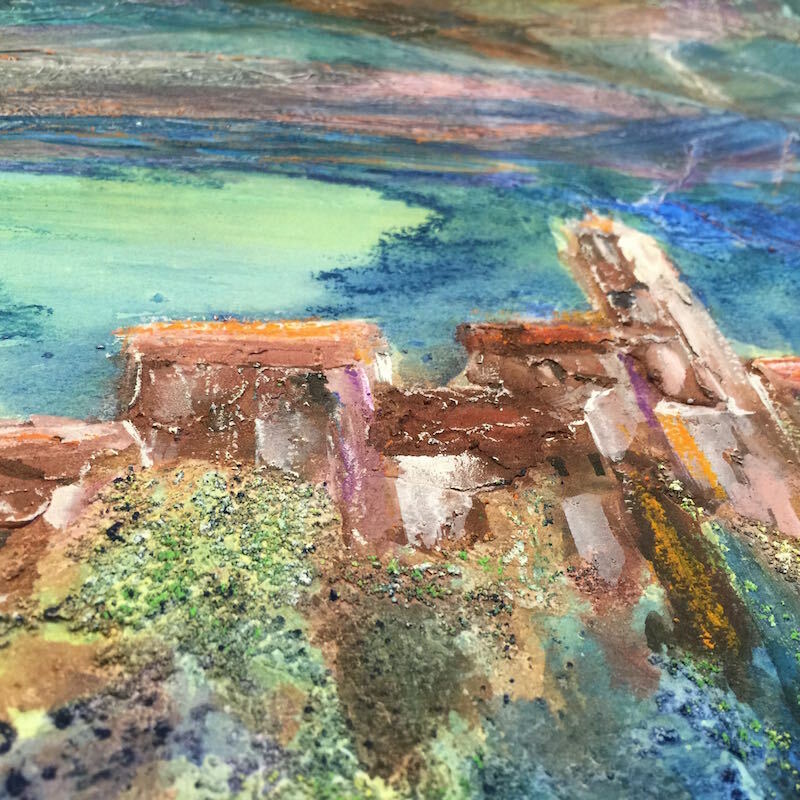 Once the composition feels ready, the individual items get stuck down with gesso and the painting is left to dry. Things to remember: non-porous materials won’t hold paint as well (or at all, if they’re not coated with gesso), and organic materials must be completely sealed to ensure they remain intact over time (and to stop your painting being attached by insects). On an impulse I added the contents to one of a teabag to my painting, so this was valuable knowledge. 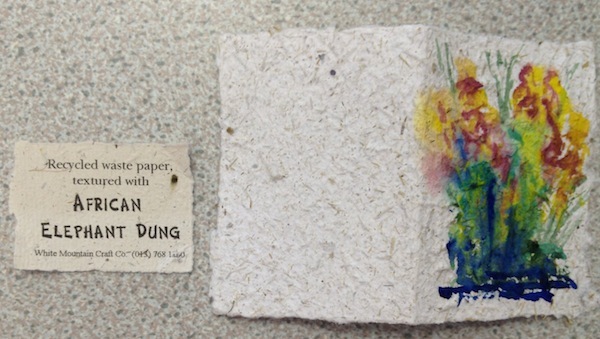 Yes, it is elephant poo paper. In a moment of curiosity, I bought some sheets of elephant dung paper in South Africa last year. I wanted to try it for watercolour painting. As you can see from the photo above, it wasn’t a successful experiment. The paper is just too soft and absorbent. There’s not enough structure to hold the pigment well enough so I wrote it off to experience and left the paper in a drawer, thinking I wouldn’t ever find a use for it. I had a flash of inspiration when I was collecting the materials for this workshop and fished it out of the drawer to bring along. It’s got a great texture for this sort of work: at last I have a use for it. After lunch, once all the gesso was thoroughly dried, we started applying colour washes with acrylic paints, and watercolour pencils. There’s more work to be done – detail to be added and textures to be emphasised. That’s tomorrow’s job. We’re also due to work on a new more structured painting tomorrow and I’m looking forward to trying out some of the textured gels and pastes.